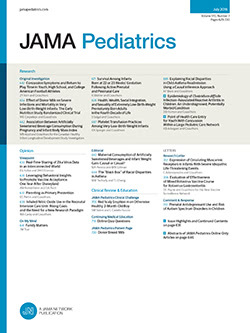 Vision: JAMA Pediatrics will be the most respected source of information for investigators, providers, and policy makers seeking the highest quality evidence to guide decision-making. Mission Statement:JAMA Pediatrics seeks to provide state-of-the-art information to individuals and organizations working to advance the health and well-being of infants, children, and adolescents. The Journal also provides a forum for discussion of the most important issues and policies affecting child and adolescent health and health care. JAMA Pediatrics will use the most current technology to make timely information available to readers wherever and whenever it is needed. The JAMA Network is a consortium of peer-reviewed print and online medical publications that includes JAMA®, JAMA Pediatrics, and other specialty journals. All articles published, including editorials, letters, and book reviews, represent the opinions of the authors and do not reflect the policy of the American Medical Association, the Editorial Board, or the institution with which the author is affiliated, unless this is clearly specified. ©2015 American Medical Association. All rights reserved. Reproduction without permission is prohibited.